The West Island has been steadily becoming known for it’s vibrant South East Asian community and the gloriously heavy, fragrant food its natives produce. It makes total sense. The immigrant population here is thriving – just take a look at the perpetually busy Adonis, Akhavan, Mourelatos grocery stores and the packed ethnic restaurants down the Sources strip (Tandoor & Grille, Aryana, Shahi Palace, Pushap etc.). Rumor has it that another Indian restaurant is quickly taking over the scene, attracting customers away from the more popular places previously mentioned and into another, more discreet counterpart: Bombay Choupati. 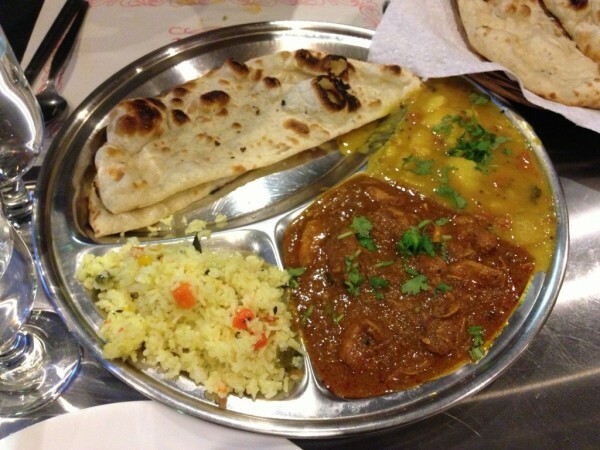 Our curiosity was piqued – what could seriously rival Tandoor & Grille in the West Island? We went in to find out. Tandoor & Grille has been put on somewhat of a pedestal in my mind. Graduating from the small, basic restaurant that it was several years ago to the huge, somewhat gaudily decorated new place, business is always good and it seems like there’s always a party happening at the restaurant (literally, Indian wedding receptions, conferences etc.). Once the move happened, we worried that the food quality might go down – cooking for more people at a faster rate, employing additional cooks who might not necessarily have the same expertise as the original chef… At first, the food seemed to be at par. It still is pretty good but the food quality is more unreliable these days – sometimes you’ll have the most amazing meal there, and other times, mediocre or below that. The little charm and homey vibe the old Tandoor & Grille had has all but disappeared. Bombay Choupati is reminiscent of what T & G was before. Great food, cozy/shabby digs. Maybe I’m being too nostalgic. In any case, let’s keep our priorities straight. Good food is the most important criteria, at least in my books. I think Bombay Choupati does it well. Read on as we dig in. First, Bombay Choupati is nestled in a corner of a strip mall, next to the Shooters pool bar on Gouin. Not a super pleasant scene – I’ve been to Shooters before and it was one of the sketchiest experiences of my life. True story. The restaurant itself doesn’t look like much from the outside or the inside, for that matter. Also, the floors are covered in carpet (never really a good sign). All this to say, we sat down to give it a fair shot. Luckily enough we snagged a spot just in time – people were constantly streaming in and out of the restaurant throughout our meal, quickly filling up minutes after our arrival. 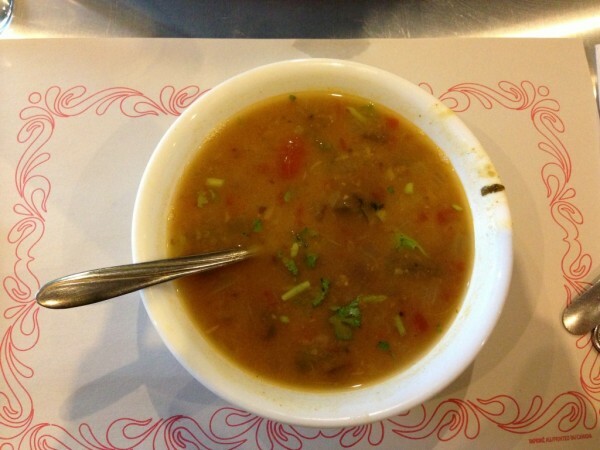 We started with a daal lentil soup. Bombay Choupati’s version is more watery and thin than most of the daal I’ve had. This isn’t necessarily a bad thing – it was actually quite good and less filling than I expected. It’s not the best daal I’ve ever had though by any means but definitely a solid rendition. 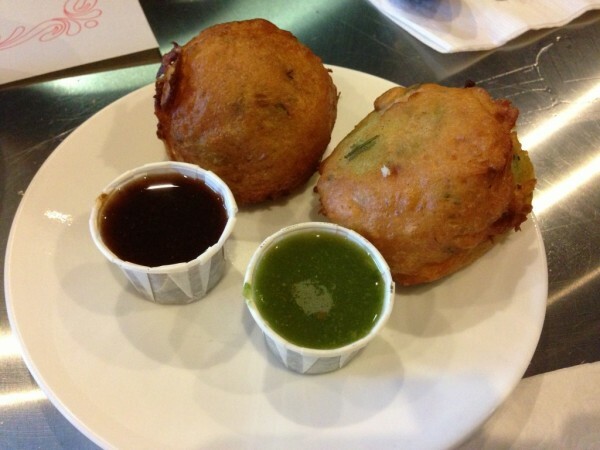 Two fried balls on a platter accompanied by two mini paper cups of sweet brown sauce and a spicier green one announced the arrival of the Bombay chole chat. Potatoes blended with chickpea curry onions made the balls relatively soft and easy to cut into but just a touch dry on the inside. Nothing that a little sauce couldn’t fix! 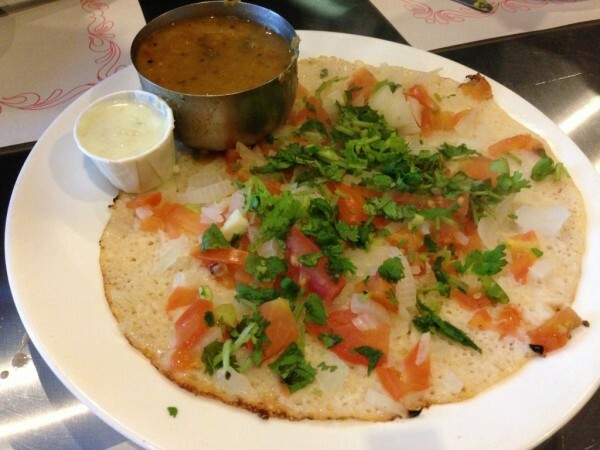 Known colloquially as the Indian version of a pizza, the uttapam is served as a steamed and piping hot rice cake, topped with a mixture of chopped tomatoes and onions. It is a dosa-like dish that’s traditionally served for breakfast in many parts of southern India and South East Asia. The dough is thick and porous, with a good amount of stretchiness and traction to it as you rip into it, allowing you to enfold whatever toppings you can with relative ease. Drizzling each bite with a good amount chunky yogurt chutney and daal (optional), the dish as a whole was pretty spectacular. Would definitely recommend you try this one. 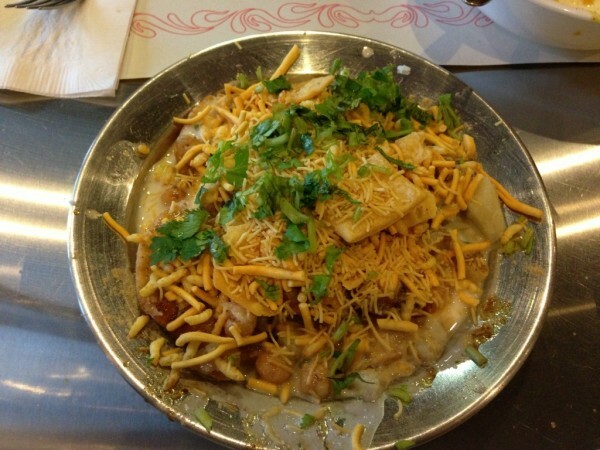 The bombay bhel is comprised of potatoes, crunchy noodles, onions and whole chickpeas. It’s hard to explain exactly how the dish tasted but I can say that it was like nothing I’ve had before. Also something I would order again. Every Indian place does cheese a little differently. 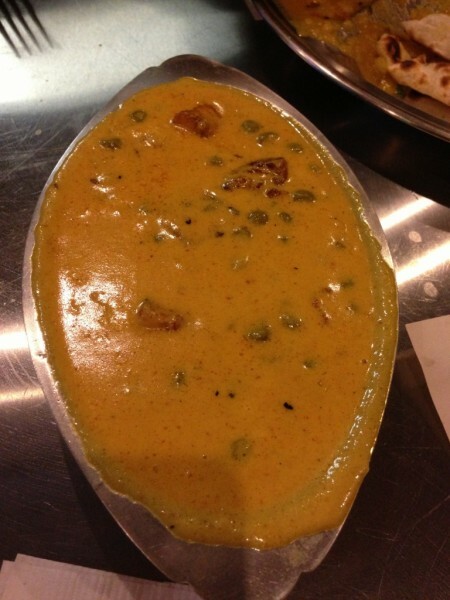 The paneer here was soft and malleable, served with a creamy sauce and tiny green peas. Tasty. 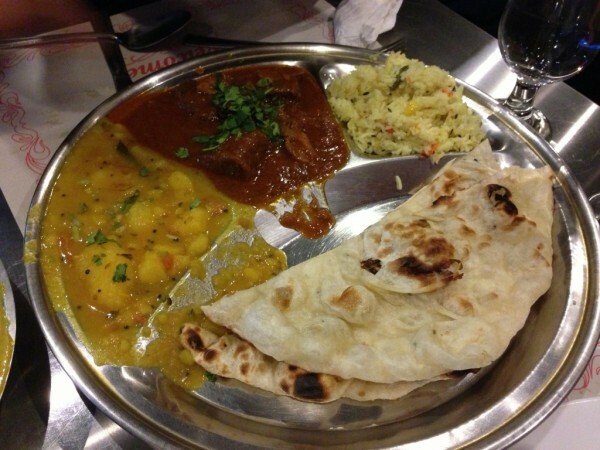 The two thali platters were exactly the same except for the curries – one was goat and the other was the chicken Madras. For me, the goat was the star of the two. Tender and soft, every piece of meat we got was flavourful and juicy. The curry sauce it bathed in helped elevate that even further. The chicken on the other hand I found dry and levels far below that of where the goat curry stood. Our meal here was different, in a good way. That’s one way to put it. This may just be the new Tandoor & Grille, at least for me. Tags: Bombay Choupati, Curry, Goat, Gouin, Indian, Madras, Montreal, Naan, Paneer, Thali.